These soft, chewy s’mores brownie bars are made with a boxed mix, a few basic ingredients, and a whole lotta love. No bonfire required! Since my hubby (the hand model below) doesn’t DO camping, though, I’ve found other ways to get those fuzzy, feet-in-the-grass summer feelings! There’s no better way to do it than with a batch of toasty, fire-roasted s’mores. But, the second best way? These incredible, easy S’more Brownie Bars. 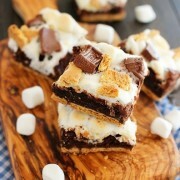 A crisp bottom layer of graham crackers rests under a chocolaty, chewy layer of brownies topped with soft marshmallows. Nestle in chopped up Hershey’s bars and crumbled graham crackers, bake ‘em for just a few more minutes, and you’ve got yourself a camp-style treat worthy of indulging in for any summer occasion! These taste exactly like a real s’more, but BETTER, if you can imagine. They definitely didn’t last long at the July 4th party I brought them to! 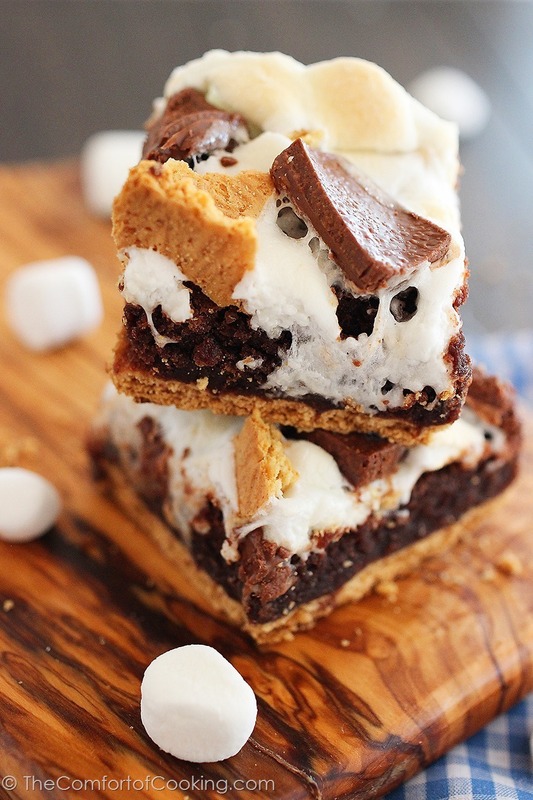 Trust me, these S’mores Brownie Bars really live up to their name! Ooey, gooey and absolutely delicious. Whether you’re trying to get your campfire fix or just baking up these bars to share with friends, you’re gonna love them! No bonfire required. Only one bowl, one pan and a little bit of patience while they bake and cool! Preheat oven to 350 degrees F. Line a 13 x 9 inch pan with aluminum foil and spray with nonstick cooking spray. Prepare the brownie batter according to package directions. Set aside. Arrange graham crackers in a single layer in the pan. Spread brownie mix evenly over crackers. Bake for 25-28 minutes, or until a toothpick inserted in the center comes out clean. Sprinkle with marshmallows, chocolate bar pieces, and crushed graham crackers. Bake 5-7 minutes longer, or until marshmallows are slightly puffed and golden brown. Cool completely before cutting (refrigerating for 1-2 hours speeds up the process). You may need to cut the graham crackers to fit the shape of the pan. This is easy to do! I’m drooling over those gooey marshmallows! Incredible bars, Georgia! S’mores Bars that are even better than the real deal? Indeed a “campfire fix” and I am so there! Gorgeous and fun photos, too, Georgia! I am dying for these bars and it is 10:20 here and I am in bed with my teeth brushed. Must go make them now. Seriously, if I were not dead tired I would!! Georgia, they are incredibly amazing. In awe over them!! HOLY MOLY! These look AMAZING Georgia! Your photos are gorgeous! I especially love the action shot with your husband’s hands. Pinning! :) Have a stellar week! I’ll be honest with you – I’m not much of a camper except for 1 reason – the campfire and the s’mores. But now I think I could skip out on the camping and make these right in the comfort of my own kitchen! I’m not much of an outdoors person but I always get very excited about the idea of s’mores! Can’t wait to give these a try this summer. Ooh Georgia these are just wonderful! I love S’mores themed treats and with the gooey marshmallows these look perfect! I’m not super into camping either..but I MIGHT be convinced if given a plate of those s’mores bars to keep me company. Those look seriously amazing! I can’t believe how amazing these look!! I haven’t had s’mores for years and combining those ingredients with a brownie is brilliant!! Great photos as well! Gosh…these calorie bombs look so crazily GOOD! These would totally disappear in my house! Oh my lawd! I would eat the entire pan all by myself. I love camping, but we haven’t been able to go yet this year. I need to make these to get my camping fix! Holy. Cow. My friends would go absolutely nuts over these–I’m going to have to make them for our next beach trip! These look absolutely sinful Georgia. We had a campfire a few weeks ago and we made smores, but before that, it had been ages since I’ve had them. My favorite smore is made using a Reese Peanut Butter Cup. That takes them to a whole new level – lol! I’m adding this recipe to my list of goodies to take glamping because I know (my luck) the first time we camp it will probably be a wet weekend and we won’t be able to have a campfire. Murphy’s Law! These are total s’mores perfection! Oh my goodness, Georgia!! These look SO amazing and just perfect! I would inhale these!! 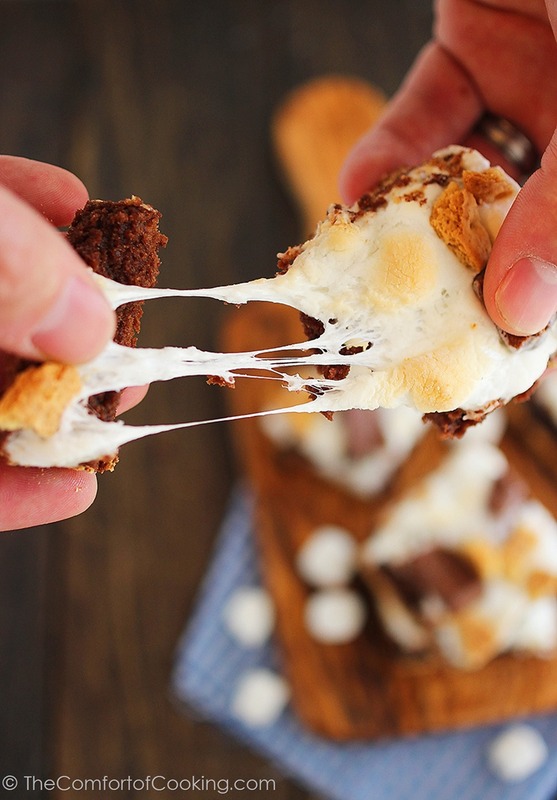 Oh my goodness, you’ve stuffed s’mores with brownies in the middle! That is genius! 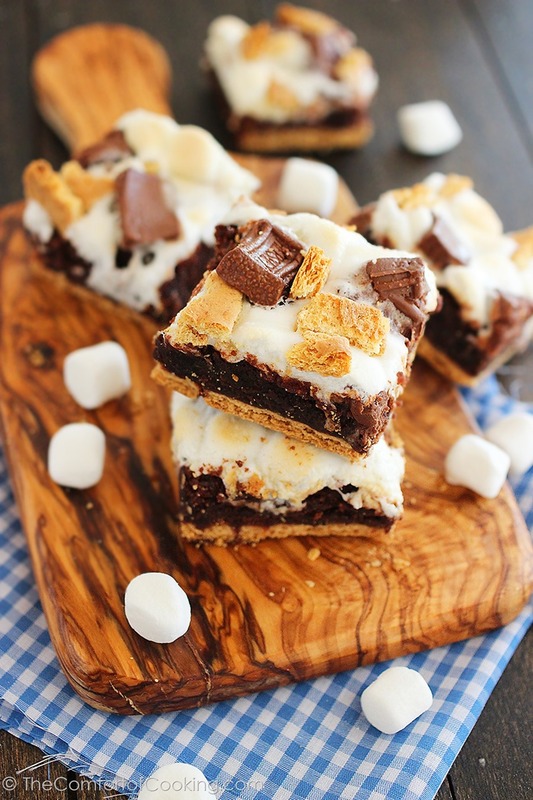 I have to admit I’m with your husband (not the camping type) but I would happily stay in the kitchen and make these s’mores brownie bars for the campers. Thanks for sharing! These are killing me because I want to go home and make them right now!!! They look amazing. Holy yum!! These look divine :) Seriously need to make these! This is crazy yummy looking. Ooey gooey is right which is what makes this so mouthwatering!! I’m always a sucker for s’mores!!! These look divine!!! We love camping! And I love smores. We’re foregoing the camping this year because of the kiddo, but now I can make believe with these bars. They look delicious! S’mores = the best part of camping! Drooling over these brownies! I have to say… I’m in the no camping camp with your husband. I like my comforts… BUT I always put up with it when I was little for the s’mores!! These bars look absolutely divine!! The recipe and these pictures just made me the happiest girl of the day! Thank you! Oh my! They look so decadent and delicious. Wow these look amazing. I am so down with ooey gooey things, especially when brownies are involved. YUM!! Oeey, gooey and brownies!!! Don’t know which of those 3 descriptions we love the most. This would be amazing warm with some ice cream!!! Pinned and shared with our followers!! These look flippin’ fantastic! I don’t really *do* camping, much like your hubby, but I’d gladly go camping if it meant I could get a few of these. YUM! Holy cow, these look AMAZING Georgia! I wish I could grab one through my screen right now and enjoy one of these heavenly bars now. Hehe, my hubby doesn’t enjoy camping too but we oh how we LOVE our s’mores and now we can enjoy them minus the campfire:) Gorgeous photos, pinned! I have been having a serious craving for s’mores lately! These look heavenly – so gooey and melty. Yum! You had me at ooey gooey. :) These look amazing! They are perfect for the summertime. I don’t do the camping scene but it doesn’t stop me from making anything having to do with smores. These would disappear here, Georgia. You have no idea how much I love S’mores!! S’more anything! My favorite. Love these. Georgia, found you through Little Kitchie and swooning over your beautiful site and photography. Thanks for checking out the crepes! I”ll be following! Clearly I’m an emotional eater. I’m so stressed today, saw those fluffy marshs, and then immediately though, I want to shovel every morsel into my mouth. Haha! And ps, gorgeous cutting board!! Girl stop it! these look so delicious and excuse me while I wipe the drool off . Such drool worthy photos and man oh man do these look delicious and chocolatey. YUM! These look SO amazing. S’mores are one of my greatest weaknesses, and yours look just perfect. As usual, your photos are dynamite. If you wrote a book on food photography, I would buy it! OMGoodness! These are just amazing, how fun to serve at a summer get together, PINNED! Oh my gosh, S’more’s Bars?? I am seriously pinning these! What a great idea for a party dessert – portable s’mores. We’re past our camping days, but used to really enjoy it. These days we want a bit more luxe than camping provides. Still like being outdoors, though, particularly if it’d involve eating these great looking S’Mores Brownies! Great concept, great dish – totally love these. Thanks so much. This looks so amazing and completely impossible to resist!! My camping days are over but my S’more eating days are not! These are absolutely delectable Georgia! I wish I had some for a midnight snack! Oh, Georgia, your photos are incredible!!! 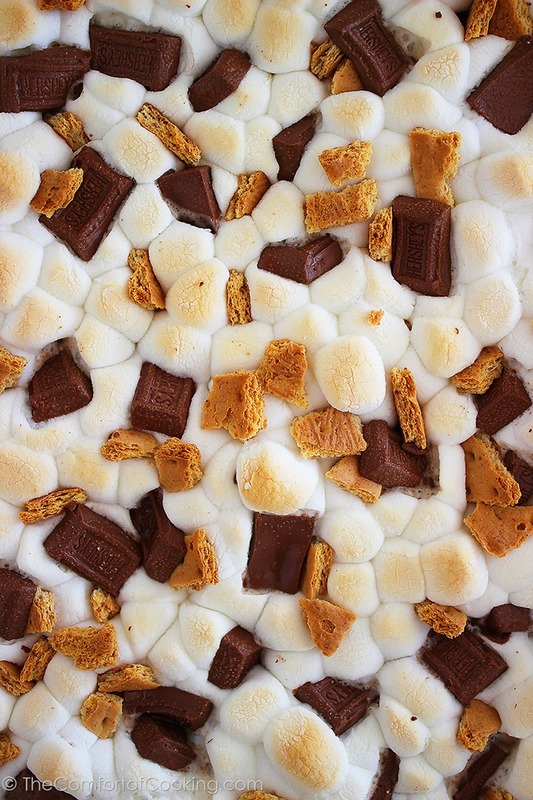 So darn enticing…I need some s’mores brownies ASAP! These look terrific!!! Ah s’mores are such a summertime classic and these look ooey gooey good indeed! Simply delicious, what a fun summer treat! These look so good! S’mores are the best thing EVER! I want to dive into that second pic and go for a swim! Sweet heavens! I’m in love, Georgia! OMG you’re killing me with these bars!!! I just want to reach right through the computer! Whoa! These are the ultimate amazing treat G! ERMAHGERD, Georgia .. these are out. of. this. world. The gooey marshmallow! The pockets of melty chocolate! I am DYINNNNGGG. And your photography is seriously mind-blowingly beautiful! So glad I stumbled on your blog! Oh my goodness girl!!! Why are these NOT in my face right now?! Oh my goodness, I must make immediately!!! You are KILLING me. I need these right now! I’ve never gone camping but I defiinitely like smores! I can imagine that these brownies are a more delicious version! I really lost my words with joy when I saw this in my inbox. I’ll have to make these for my son when I go home! Totally drooling, and desperately wishing I had all of these ingredients in my house right now!! Is it bad that I want to just dive into that 2nd photo.. with all the marshmallows and chocolate? These brownies would make my kids jump up and down. YUM! Pass along the entire pan because I know for sure I could eat it all. This is so fantastic. That second shot? All the marshmallows? LOVE. Yum! I don’t enjoy camping. What a great way to get s’mores in! *sob* I just…love s’mores… SO MUCH!!! I weep every time I see a graham cracker containing recipe. I forgot to pack them in my suitcase. :'( And I decided against buying graham flour. So mad at myself! Oh and plus I just made homemade marshmallows making it all the more painful that I don’t have graham crackers. Awwww! Buy ’em on Amazon or swap out with Nilla Wafers maybe? I made these yesterday for game night and they were a huge hit! Absolutely delicious and nobody could believe they started with boxed brownies :) These are a definite keeper. In a word… Yum!! I want one now! :-) Brings back memories from my childhood around the campfire. Great photos and awesome post! I have them in the oven right now.. last step… 4 more mins remaining.. it smells divine in here! !